We recently had the opportunity to try out a book series written by the talented Susan K. Marlow, called Thick as Thieves. Well we had the privilege to try out another one of her adventure stories published by Circle C Adventures, Tales from the Circle C Ranch ($7.99 plus 2.00 s/h) and also use the accompanying Andrea Carter's Tales from the Circle C Ranch lapbook ($7.00). Susan K. Marlow has hit the mark again. She has created a series of short stories that are not only creative and fun to read, but also educational. 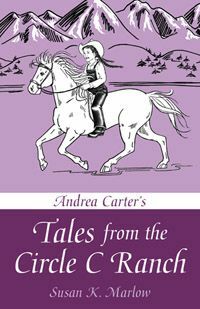 Tales from the Circle C Ranch is a collection of short stories where we get to read about Andi Carter's, but really learn more about her life. This collection of stories was inspired by questions that were written in by readers wanting to know more about her. In Tales from the Circle C Ranch you get to learn more about Andi's father, her friend Jenny Grant and so many other things. This is a great book for readers as they transition from Circle C Beginnings and the Circle C Adventure series. This title would be good for independent reading in Grades 4-5 and up. We are near this stage for independent reading, but Lydia needed some help so we did these as a read together. Lydia reminds me a lot of Andi. She loves horses and would spend all the time she could with them if we owned horses. In fact, I see that as a good reason to not get horses....lol. We have been enjoying the Circle C Adventures series by Susan K. Marlow for a few months now, and Tales from the Circle C Ranch was not a disappointment. We have been enjoying reading about Andi's adventures. Whether it be arguing about wearing overalls or hiding a pet snake named Clyde, I have enjoyed this wholesome and clean reading materials which is so hard to find today. These are stories that are short, so they keep Lydia's attention for read-alouds, and I am not afraid to let her read them on her own. I know there is nothing that I would not want Lydia to be reading in the stories. The accompanying lapbook, Andrea Carter's Tales from the Circle C Ranch lapbook that you can purchase has been created by www.journeythroughlearning.com. We have used several of their lapbooks and really enjoy the material and the presentation. 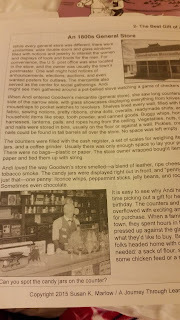 Andrea Carter's Tales from the Circle C Ranch lapbook has not been a disappointment. This lapbook covers historical, geographical, poetry writing and scientific studies. You and your children will be digging deeper into learning about life in the 1800s. 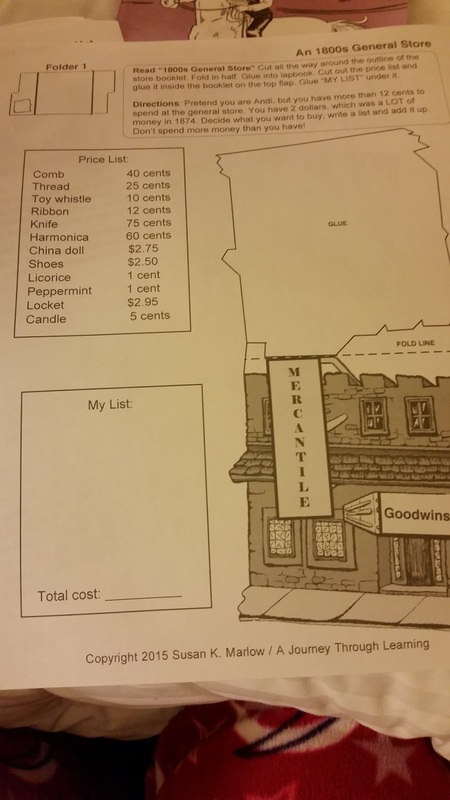 What was the clothing like and what were the stores like that you would've shopped in. The history of Fireworks, snakes and weather such as blizzards are looked at. The Andrea Carter's Tales from the Circle C Ranch lapbook helps your child get the most from the stories that they are reading. Each topic has research material provided along with the components you need to create a lapbook. 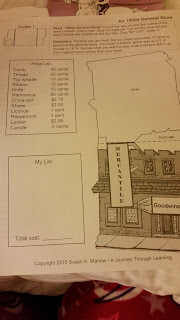 The research material that is provided to go along with each story really helps you to turn Tales from the Circle C Ranch into a unit study with the help of the Andrea Carter's Tales from the Circle C Ranch lapbook. Lydia is not a fan of cutting out lapbooks and completing them, but this is definitely worth the little bit extra because of the information provided. All the work is done for me to really turn this book into several different school lessons. Currently we are spending a couple days reading the story together from the Tales from the Circle C Ranch. I usually have to limit read aloud time to around 20 minutes at a time due to attention span issues. 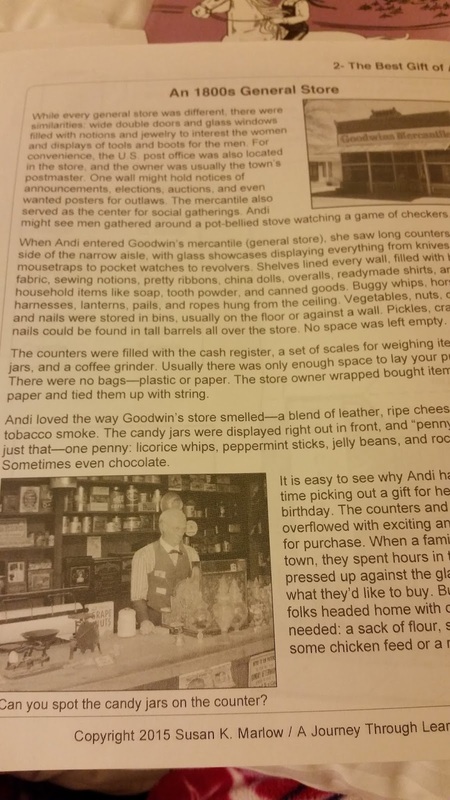 But then we spend time reading through the material that goes with the story then in the Andrea Carter's Tales from the Circle C Ranch lapbook. This has allowed us to review material we have read in the past about the 1800s but also allowed us to learn more about a wide variety of other topics, all while reading about a girl who loves horses. Currently the Tales from the Circle C Ranch is one of Lydia's favorite books. We can't wait to keep reading and also continue reading the Circle C Adventures books starring Andi Carter. Several members of the Schoolhouse Review Crew were given the opportunity to try out both Tales from the Circle C Ranch and the Andrea Carter's Tales from the Circle C Ranch lapbook. Take some time to visit the Schoolhouse Review Crew blog to see how they have been using these materials in their schools.